When Liverpool signed Virgil van Dijk a year ago, I thought they had signed a good player. I underestimated him. Few have had such a profound and immediate influence on any Liverpool team. Since his goalscoring debut in the Merseyside derby last January he has proven one of the most instantly successful Anfield recruits of the last 30 years. He rates alongside Mohamed Salah, whose debut season was extraordinary, in that regard. But if Van Dijk continues as now - and Liverpool win trophies - I will rank him even more highly. We will be talking about Van Dijk as we do John Barnes, Kenny Dalglish and Graeme Souness - Liverpool legends who from the moment they put on the shirt imposed themselves on the team and club to elevate everyone else. Moreover, should Van Dijk prove the difference between Liverpool going close to and winning major trophies he will join the list of the club's greatest centre-backs. Playing centre-half for Liverpool brings inevitable comparisons with some of the best ever - Ron Yeats, Emlyn Hughes, Phil Thompson, Mark Lawrenson and Alan Hansen. Van Dijk can even surpass some of those names to ensure future generations talk about him in the same glowing terms. He will find himself alongside Hansen in an all-time Liverpool XI. But, I stress, he has to win the Premier League or Champions League at the club to achieve that. Seeing it through to the end of his career to bring the club these rewards is what separates the world-class Liverpool signings who are considered legends, and those who came and went without delivering on their spectacular introductions like Fernando Torres and Luis Suarez - great players who never won enough at Anfield. 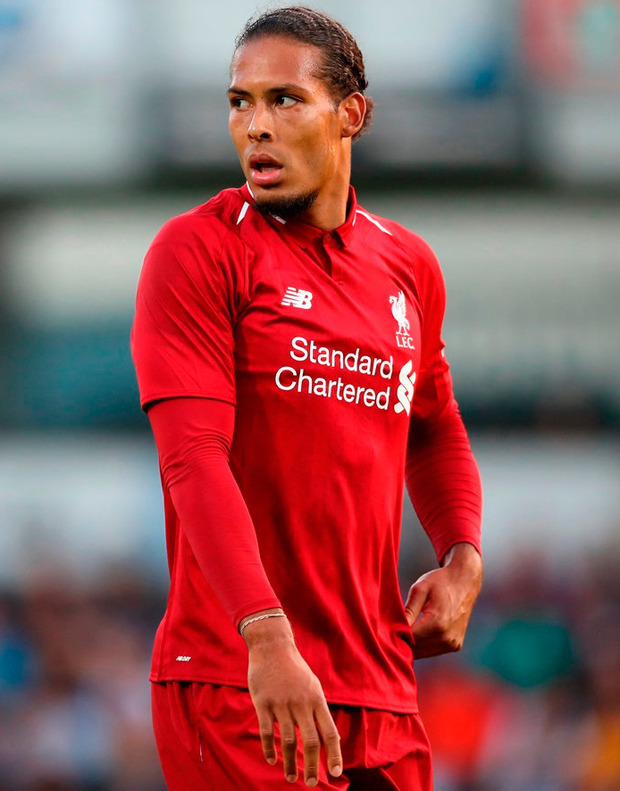 Van Dijk is the best defender in English football, with only Aymeric Laporte's form at Manchester City's reaching similar levels. Never mind his position, he has risen to become one of the best in the Premier League, full stop. I would rank him with David Silva, Eden Hazard, Kevin De Bruyne, Harry Kane and Salah. Early as we are in the season, Van Dijk will be challenging the familiar names for the Player of the Year award come May. I have been reluctant to go as far as saying Van Dijk is the best defender in the world given Sergio Ramos and Raphael Varane have won a World Cup and numerous Champions Leagues. What I would say is this: at this moment I would not swap Van Dijk for any other centre-back. The only caveat to all this is his medal haul, which has to significantly grow to ensure this argument stands the scrutiny of time. These may sound extravagant claims on behalf of a player who has been at Liverpool less than a year, but the difference between Jurgen Klopp's defence before and after Van Dijk's introduction in the FA Cup third round tie against Everton back in January is extreme. Liverpool have conceded only five Premier League goals this season, which is currently one better than the club's greatest ever defensive performance of 1978-79. Before Cardiff's late consolation in October, Liverpool's defence had gone 917 minutes without conceding at Anfield - nine home clean sheets in a row which equalled a club record. These statistics tell only part of the story. When you watch Liverpool now you see why they are so tough to beat. Okay, they have had setbacks in Europe, but even these were narrow defeats at difficult venues. Domestically, they have lost only three league games in 10 months. There is Liverpool's defence before Van Dijk - vulnerable, careless, prone to giving away unnecessary goals every time the opposition had a corner or free kick in a wide area - and there is the current side which is hard to even create chances against, let alone score. Managers may have feared Klopp's strikeforce a year ago, but they always felt a chance would come with patience. Now there is more hope than expectation of this from opponents. Watching Liverpool now reminds me of the best teams I played for under Gerard Houllier and Rafa Benitez. We were not free-flowing, attacking sides but built our successful periods on defensive resilience. In 2005-06, I took huge pride from our defensive record when, early in the season, we kept eleven consecutive clean sheets in all competitions, and conceded only 25 goals in 38 Premier League games. Klopp's Liverpool can smash that. We can easily identity the best centre-halves in recent Premier League history. I believe John Terry was number one, possessing everything a manager would want - courage, as good as anyone in the air, tactically sound and a real leader. Then you had Rio Ferdinand, calm on the ball and with that additional speed enabling him to get himself and his team-mates out of trouble. They and others possessed another special, essential quality. The best centre-backs make those around them look better. When you first get into the side in that position, your overriding priority is personal performance, doing your job, making sure you are always in position and never responsible for conceding a goal. As you improve this changes. You become so confident you play for your defensive partners too, identifying where they should be and guiding them through the match. You feel like you are playing two games. Van Dijk is at this point. You see it in how he controls Liverpool's back four, bringing everyone else up to his standard. All of them deserve credit and it's a much-changed line-up compared to 18 months ago, but the catalyst is obvious. What is so frightening is Van Dijk ticks so many of the same boxes as Terry and Ferdinand, like a fearsome combination of the two. He is quick as well as elegant in possession. He too is a leader for club and country. It was telling Ronald Koeman gave Van Dijk the armband for the Netherlands - who are also transformed in the last 12 months - and Liverpool's players voted the Dutchman to skipper the side in the absence of others. What could I criticise him for? Given his superiority in the air, he could have more goals than his solitary strike on that debut against tomorrow's opponents. The move to Anfield has unlocked elements of his game which were less obvious at Southampton and Celtic. The first time I saw Van Dijk and thought he was special was actually against Liverpool, a 0-0 draw in which he not only caught the speeding Sadio Mane but completed a perfectly timed tackle to stop a certain goal. When I spoke to former Celtic manager, Ronny Deila, who was in charge when Van Dijk moved to Southampton, he suggested the younger Van Dijk lacked intensity in his game and in training. Even Koeman has recently suggested Van Dijk is sometimes 'a little bit too laid back'. The responsibility and adulation at Anfield has maximised concentration levels, but there are times when the game looks too easy for him. You never see Van Dijk at full stretch. It makes you wonder if he has a few more gears in him. For a succession of Everton managers leading a team to Anfield, the biggest tactical headache has been the damage Liverpool's front line can inflict. Marco Silva goes there with a problem even some of his recent predecessors did not face. It is no longer just stopping Liverpool that is the issue. Landing a glove on a defence led by Van Dijk is as difficult as preventing Salah scoring.